This is the way to introduce the 4x table as it relates to the 2x table. The transition is easier when students know the 2x table and can transfer this knowledge to the 4x. They gain confidence in their own ability to see the patterns. I have included a multiples ladder on each board which you can see in the PREVIEW. You can black out this feature if you don't need to provide this level of scaffolding. 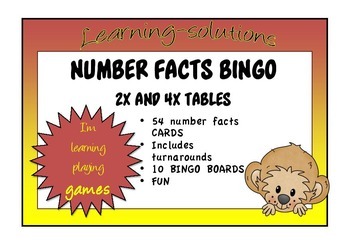 You can use this game in an intervention session, as I do, or you can use it across your whole class. I have 10 Bingo Boards and you can combine your students into groups of 3 to play with one board. This is a good way to mix ability groups and it is very inclusive. Give each player 3 counters each to cover numbers. Alternatively, put it in a Maths Centre for consolidation. Using short games like this for the beginning or end of an Intervention Session provides the fun element and a positive attitude to learning that facilitates progress. I laminate all my games and they last for years. I recommend boxing and labelling them so you can access them quickly and you will find they will provide good value as you use them over and over.